Gum disease is silent for the first part. It creeps up on you with only a few signs that you need to be on the lookout for, but little or no discomfort along the way. Many people assume their gums must be healthy if they don't hurt, but that is not accurate. If your gums were healthy, they not only wouldn't hurt, but they also wouldn't have any early signs that you may have gum disease. The most common sign that people often relate to gum disease is bleeding gums. If you brush your teeth and your gums begin to bleed, this could be the first sign of gum disease. When looking around your mouth, you will likely see puffiness around your gums. 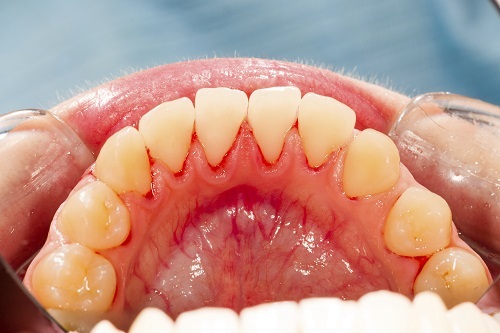 Instead of your gums being a really light pink, your gums could either be a pale pink, almost white, or your gums could be a darker pink, nearly red. It may not be all of your gums, so it is important that you look around your mouth carefully. If you have noticed anywhere in your mouth look like this, bring it up at your next dental cleaning appointment. You don't want gum disease. It leaves you with sore teeth, gums, and the prospect of tooth loss, among other issues. Gum disease has also been linked to increased risk for heart disease and other ailments. Taking your gum health seriously allows you to get the benefits of having healthy teeth and gums, plus decreases the chances you will be struggling with any other ailments related to your gum disease down the line. Don't take the chances that your gums are healthy on their own. Take care of them with proper brushing and flossing techniques, plus seeing your dentist every six months like clockwork. Please contact our office if you have any questions about gum disease.